Devon, who’s always been the one to take them, gave a half-hearted attempt at filling out logistics. There’s a grownup, Christopher, who runs it. He’s got an armory of foam-covered PVC quarterstaffs, elegantly-decorated homemade foam broadswords, halberds, maces and…. other things that I’m sure have some historical basis. Like the five-foot long duct-tape-wrapped scimitar festooned with dangling foam-filled tube socks. Apparently, it’s called “Nixon”, and I didn’t have the nerve to ask any more. But they gather on Sunday afternoons in Mitchell Park. 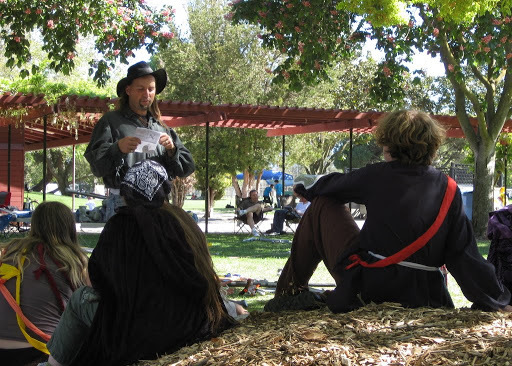 Christopher defines quests and battles, partitions off a groups of vaguely-medieval-garb-meets-tie-dyed kids into teams, and sends them off to wage mayhem against each other or forces unknown. 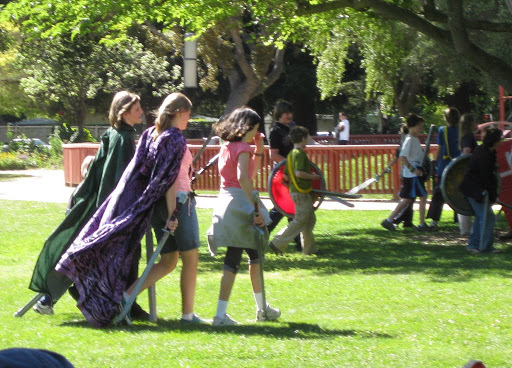 It’s life-sized-dungeons and dragons meets ren faire meets the most awesome game of tag you’ve ever seen. Or something like that. There are, of course somewhat elaborate rules on what counts as “dead” when you’re whacked where with what kind of weapon, and what it takes to heal you. And what kind of weapon you can wield and how, depending on whether you’re a druid or elf or hobbit. But that’s not entirely obvious from the sidelines, as one of a couple dozen parents who – with lawnchairs and Sunday crossword puzzles – have come to expect their Sunday afternoons to be spent schmoozing in the shade while their offspring battle the forces of darkness. Mind you – this isn’t any regimented historically-finicky SCA-for-kids training ground. 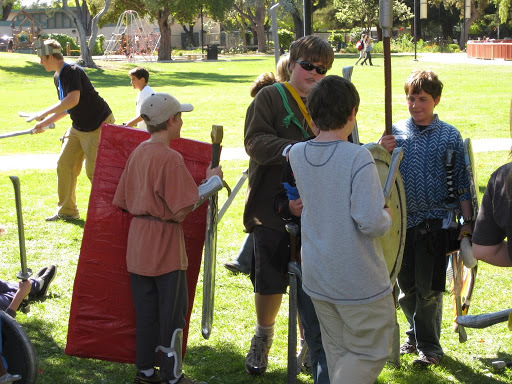 It’s crazy running and yelling, kids careening around the park on a Sunday afternoon having the time of their lives banging away at each other with foam swords, with no adults saying STOP THAT OR YOU’LL HURT SOMEBODY. And along the way, they’re picking up little bits of history, and leadership and teamwork and planning skills. And getting a surprising amount of exercise mixed in with the grass stains. How cool is that?